UNICEF Indonesia has launched a print and television advertising campaign to promote a healthier television watching habit for children. 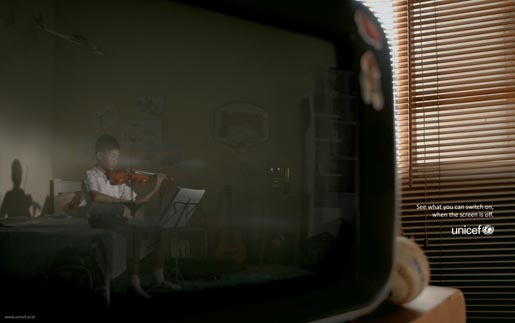 Three 15-second TV advertisements show a boy practicing his violin, a mother and father playing with their daughter and a group of friends playing with homemade toys in their garden, all reflected on a darkened television screen. The tag line read: ‘See what you can switch on when the screen is off’. The TV public service announcements and matching print advertisements, available in Indonesian and English, were produced and placed in several major media outlets by Lowe Indonesia for UNICEF on a pro-bono basis. The Screens campaign was developed at Lowe Indonesia, Jakarta, by executive creative director Din Sumedi, creative director/copywriter Ferly Novriadi, art director Tania Huiny, agency producer Bimoyadi Soemarmo. The print campaign was produced by Anton Ismael and retoucher Alexander Loppies. 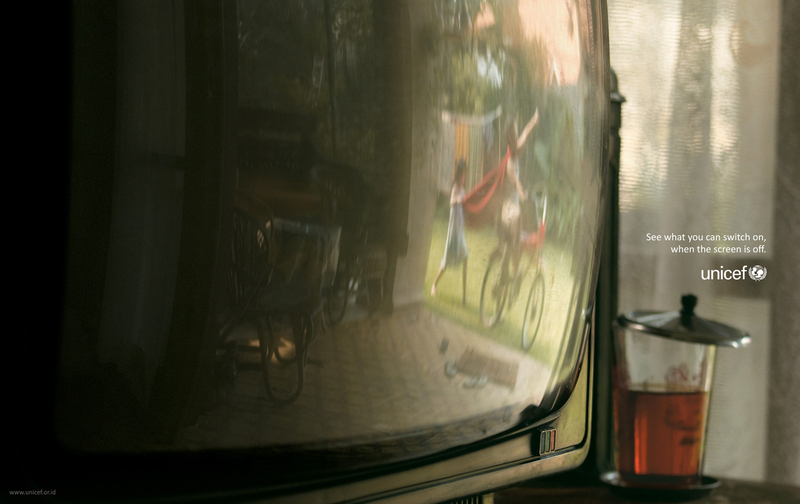 Filming was shot by director Bona Palma via Square Box Cinetech with director of photography Sven Lippold. Post production was done at CineRed Jakarta. Recent studies undertaken by the Indonesian research institute, YPMA, in partnership with the Government of Indonesia and sponsored by UNICEF, found that Indonesian children watch an average of 30- 45 hours of television per week. Children’s access to the internet is increasing with the availability of WAP-enabled handphones, and affordable internet cafes. Both these media provide great potential for children and young people to access information that can help them with their studies, with their exploration of cultures and countries, and with their understanding of their environment and that which lies beyond Indonesia’s shores. At the same time, increased access to the media creates increased access to potential harm for children. 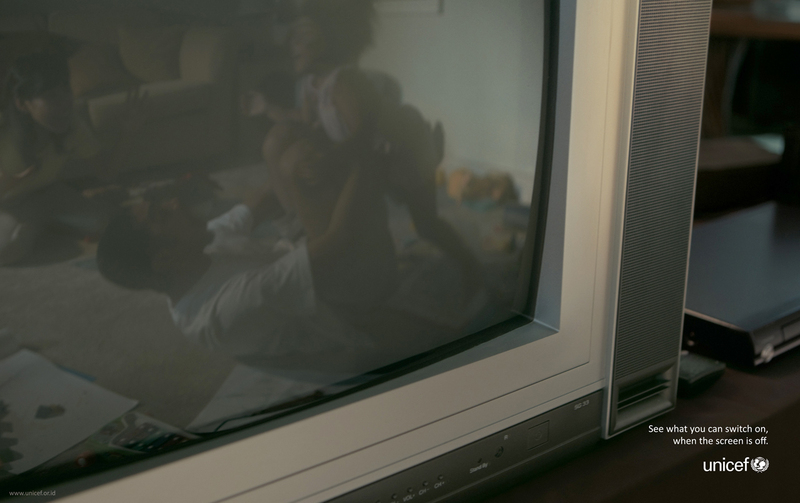 Despite efforts by the Broadcasting Commission to moderate programming, the YPMA research found that at least one quarter of television programmes is considered “unsafe” for children’s viewing, and that often children watch television without parental supervision. Nearly 40 per cent of children covered by the research said that their families also placed no restrictions on internet access. Playing video games – many of them containing violence – are also generally unsupervised activities. Awareness of the impacts of heavy viewing and unsupervised media consumption is still low. There is an acute lack of understanding of the need for family discussions and alternative activities to control children’s heavy media consumption habits. UNICEF Indonesia is working with the Ministry of Information and Technology, the Ministry of Women’s Empowerment and Child Protection as well as research institutions, civil society organizations and the private sector by supporting studies, coalition building and public awareness events such as the Television Free day every July.